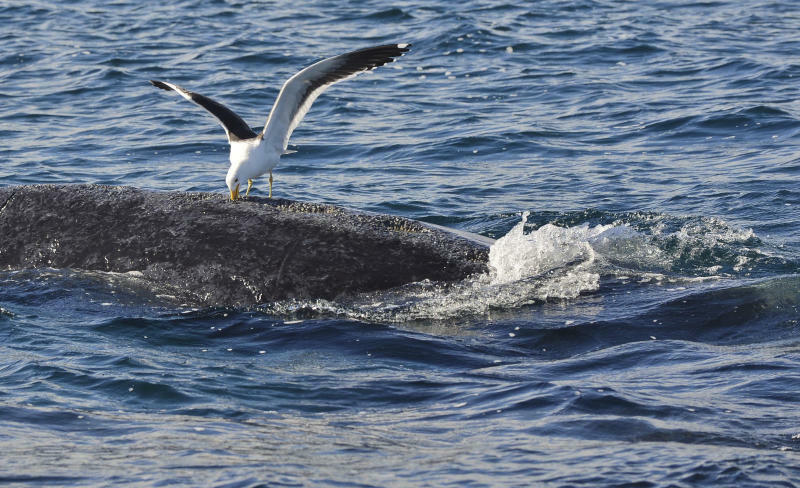 BUENOS AIRES, Argentina (AP) — What began as bizarre bird behavior has turned into something out of a horror film for threatened whales in Argentina, where seagulls have learned that pecking at the whales' backs can get them a regular seafood dinner. Seagull attacks on southern right whales have become so common now that authorities are planning to shoot the gulls in hopes of reducing their population. Environmentalists say the plan is misguided and that humans are the real problem, creating so much garbage that the gull population has exploded. Both sides agree that the gull attacks in one of the whales' prime birthing grounds is not only threatening the marine mammals, but the region's tourism industry as well, by turning whale-watching from a magical experience into something sad and gruesome. Seagulls around the city of Puerto Madryn discovered about a decade ago that by pecking at the whales as they come up for air, they can create open wounds. Then, each time the whales surface, it's dinner time: Gulls swoop down and dig in, cutting away skin and blubber with their beaks and claws. The problem has only grown more severe since then as more gulls caught on and the bird population exploded due to easy access to human detritus — not only open-air garbage heaps but fish parts as well, dumped directly into the water by fishermen and a seafood packing plant. "It's not just that the gulls are attacking the whales, but that they're feeding from them, and this way of feeding is a habit that is growing and becoming more frequent," said Marcelo Bertellotti, who works for the National Patagonia Center, a government-sponsored conservation agency. "It really worries us because the damage they're doing to the whales is multiplying, especially to infant whales that are born in these waters." Whales also are changing their behavior in response: Instead of breaching the water and dramatically displaying their tails, they rise just barely enough to breathe through their blow-holes before descending to safety, Bertellotti said. Bertellotti's answer: Shoot the gulls that display this behavior with air rifles and hunting guns, and recover each downed bird before they are eaten along with the ammunition, causing still more damage to marine life. His "100-day Whale-Gull Action Plan" was approved by the government of Chubut, and provincial officials came out Tuesday in defense of it. "We are preparing a pilot plan that seeks to stop the damage from the gulls that pick at the flesh of the whales, because this is putting at risk the resource. It will be a minimal intervention to protect the life of the southern right whale and thus provide a response to the complaints of the sightseeing businesses that operate in the place," Gov. Martin Buzzi posted on his Facebook page. Whale-watching is big business for Chubut. Southern right whales have recovered to about 8 percent of their original population since becoming a protected species worldwide, and hundreds come to the relatively calm and warm waters of the gulf formed by the Valdez Peninsula to give birth and raise their newborns each July to December. Seeing them surface from nearby boats can be a magical experience, and gull attacks were rare until about eight years ago, said Milko Schvartzman, who coordinates the oceans campaign for Greenpeace in Latin America. But more gulls have caught on, and their population has boomed to the point where whales are attacked at least every fourth time they surface, he said. Now the tourists are suffering along with the whales. "It's not so pleasant anymore," Schvartzman said. Environmentalists say the only way to effectively reduce the seagull population is to deny the birds food by closing open-air garbage dumps around the gulf and stopping people from dumping fish parts. Activists have been lobbying Chubut for many years to develop plans to reduce, recycle and properly contain garbage and strictly regulate fishing, but politicians have resisted, Schvartzman said. Chubut's environmental minister, Eduardo Maza, blamed the problem on previous governments, and said the province is now working on permanent solutions. Shooting the gulls "is surely not the most pleasant measure, but it's necessary to do something to control a situation that has been growing after many years of inaction," Maza said. "At year's end, we're going to inaugurate garbage-separation plants," Maza said. "All the garbage in the protected Peninsula Valdes area that isn't recyclable will be properly disposed of, which will enable us to mitigate the open-air garbage dumps." Schvartzman said that if humans don't solve the problem quickly, the whales will simply stop coming.